It seems rare that in my normal rotation of vehicles to review, I get a convertible in warm sunny weather. Somehow, they always seem to come at some stage of the gray, rainy, Pacific Northwest winter. However, I lucked out during this year’s 5-Star summer, as I got to drive the current-generation Mazda MX-5 Miata. 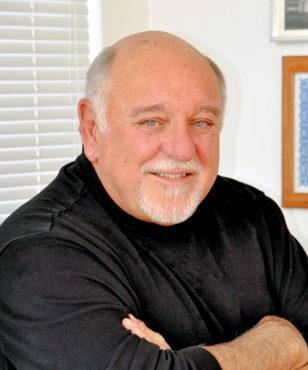 However, after a mild refresh in 2013, it was like saying goodbye to an old friend. The third-generation Miata, which comes in three levels – the Club, Sport, and Grand Touring – will be the last of this fun little roadster, as the next Miata is being co-developed with Alfa Romeo. I hope the car doesn’t lose the magic that has made it the most-raced vehicle on any given weekend – worldwide. And with over 900,000 built according to the Guinness World Records, the MX-5 is the “Best-Selling Two-Seat Roadster” on the planet. If this was to be my last time behind the wheel of the MX-5 Miata, I couldn’t have asked for a better goodbye than the Zeal Red Grand Touring model with a power, retractable hardtop, six-speed automatic with paddle shifters, great weather, and some exhilarating driving on the winding back roads between Rainier, Oregon and the burbs west of Portland. The Miata has been around for more than 20 years, and has remained true to its roots – an affordable, front-engine, rear wheel-drive, two-seat roadster with an energetic, small-displacement powerplant offering lively performance, responsive handling, and a high fun-to-drive quotient. It’s everything and more 60s-era British sports cars like the MG and Austin Healey aspired to be, without the undependability factor they were famous for. While there are bigger, faster, flashier, choices (can you say Jaguar? ), the MX-5 Miata’s universal appeal to both sexes of all ages is unmatched worldwide, and the 2014 MX-5 Miata perfectly upholds its tradition of affordable, reliable, pure driving fun. Walkaround: Styling of the Mazda MX-5 Miata is evolutionary, not groundbreaking. Although continually refined over the years, it looks much the same as it did upon its debut, making it immediately recognizable as a Miata. Except for three new colors, there are no other changes for 2014. Interior: The MX-5 Miata is not a big car and, and doesn’t offer a lot of spare interior room. It’s a snug, but comfortable fit for a guy my size – six feet tall and 215. Both legroom, and the seats may be tight for people bigger than myself, however, the seats are fittingly supportive for enthusiastic driving. Fit and finish are excellent, with good quality materials. Available features include heated leather seats, a 7-speaker Bose audio system powering the AM/FM/6-CD/SiriusXM Satellite radio, Bluetooth, and even automatic climate control – all of which our test model featured, along with a tilt leather wheel with controls for the audio and cruise. It also had A/C, remote power door locks and windows, and an auto-dimming rear view mirror. A welcome improvement from the original, is a surprisingly spacious trunk considering the size of the MX-5 Miata. I was able to fit a medium size suitcase, and some other items, as well as lay a dress suit on a hanger down over them with room to spare. The original Miata had barely enough room for a briefcase. Also, the retractable-hardtop — which isn’t offered with the Sport version — doesn’t intrude upon that trunk space, giving up only a small storage spot behind the seats. 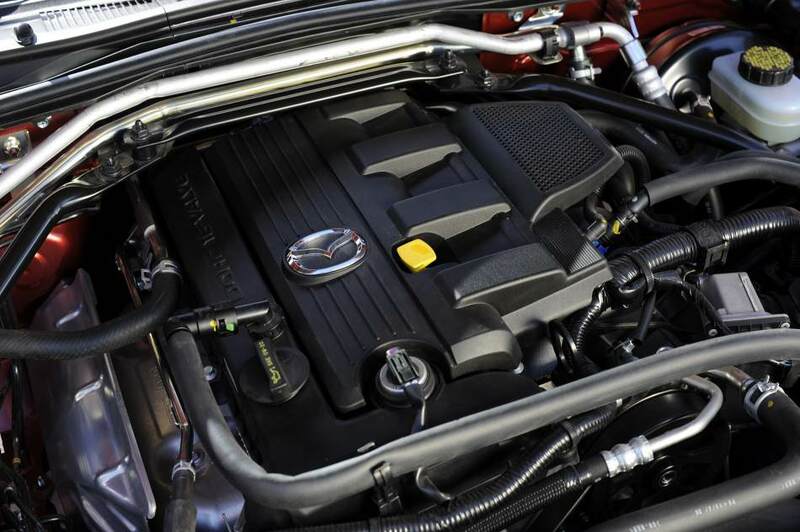 Under The Hood: Unlike some other cars, there’s no supercharged or turbo V6 shoehorned under the hood to throw off the 50/50 weight balance. 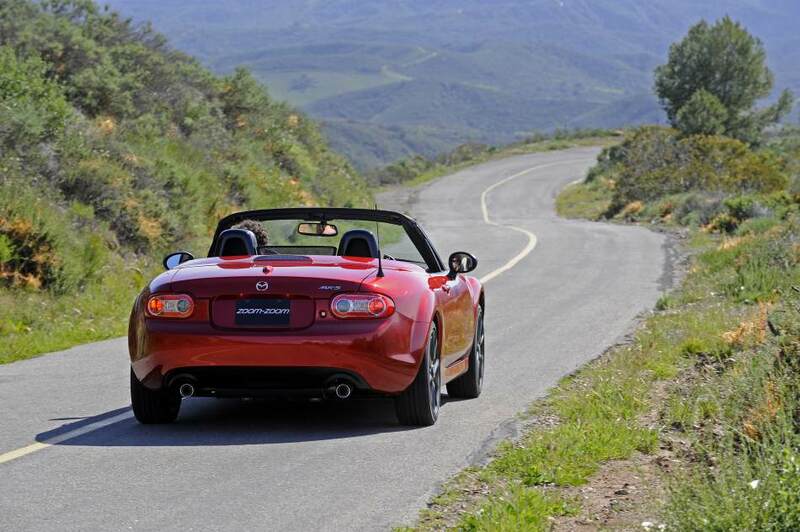 Instead, the MX-5 Miata sports a high-revving. 158-horse, 2.0-liter in-line four banger that responds enthusiastically while putting down 140 lb-ft of torque and sipping fuel at the rate of 28 mpg (21/city, 28/highway, combined 23). There’s 167 horses available with the manual transmission. Transmission choices are a five-speed manual on the Sport version, a six-speed manual or 6-speed automatic with a manual shift feature and available paddle shifters. Behind The Wheel: As I found out – once again – it’s almost impossible not to love driving the 2014 MX-5 Miata. At around 2,500 pounds, it’s light, tight, and nimble, with nearly equal front-to-rear weight distribution. It rides on a very sophisticated fully independent suspension engineered to deliver the ultimate fun-to-drive experience, totally connecting the driver to the pavement. The electronic power rack-and-pinion steering is sharp, and braking is excellent thanks to 4-wheel discs. I had two opportunities to drive the curvy back road calling itself Oregon Highway 47, and it was an absolute blast. Using the perfectly positioned paddle shifters aggressively — rather than the brake pedal — was more driving fun than I’ve had in awhile. This car hugs the road like a cat, while freeway driving isn’t at all unpleasant, and your body doesn’t get beaten up by bad pavement. Whines: It’s somewhat disconcerting to look in the rear view mirror with the top down and see an SUV grille up close and personal at 70+ mph. Also, if getting in and out of the car challenges your physical dexterity, the Miata might not be your ideal daily driver. 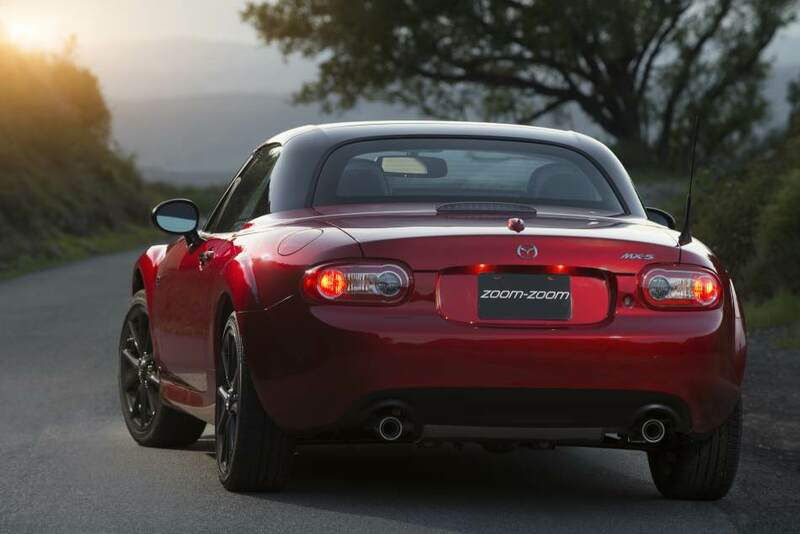 Bottom Line: If you’re in the market for a two-seat sports car, the Mazda MX-5 Miata should be high on your short list. Besides being a stellar performer, a bonus factor is its historically high resale value — a salute to its long-term desirability as well as reliability. I’ve driven other sports cars that are faster, bigger, more luxurious — and of course pricier. However, none are more fun to drive. Personally, I’d buy this car in a New York minute. Zoom Zoom.